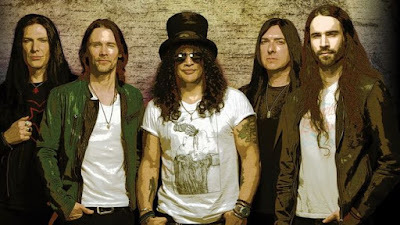 Directed by Clifton Collins, Jr., the footage was shot by fans as requested by the band during their October 16 show at the Hollywood Palladium – where bassist Duff McKagan made a special appearance on a Guns N’ Roses classic. Fans submitted their video clips via the the Cinebody app so that it could compiled into the song’s official music video. Produced by Michael “Elvis” Baskette (Alter Bridge, Iggy Pop, Incubus), “Living The Dream” recently debuted at No. 27 on the US Billboard 200. The band will next be seen on a January 2019 tour of Japan, New Zealand and Australia before hitting the UK and Europe for shows starting in early February. Slash is currently on the road with Guns N’ Roses for a series of fall dates that will wrap up with their first-ever concert in the state of Hawaii at Honolulu’s Aloha Stadium on December 8.